From a lecture room in Leiden to the avenues of Accra: what has and hasn’t been useful? What am I doing in Accra? For the past 3 months I have been based at Impact Hub Accra, Ghana, as part of my combined internship and research requirement for the 1-year African Studies master. While based at Impact Hub Accra I have been assisting the team with business development as part of my internship responsibilities. My research, meanwhile, focuses on the role that the hub plays in facilitating the pathway of local entrepreneurs. In this series of blog posts I will be sharing some experiences of my time here. What does a day in my life look like, who do I hang out with and what kind of work am I doing? These are just some of the questions I will be answering in order to give you a glimpse into what it’s really like to conduct your internship and research in Africa. In today’s post, I reflect on how the course material covered during the MA African Studies programme has (or hasn’t!) been applicable ‘on the ground’ in Ghana. Prior to commencing my master’s programme I had travelled extensively across the African continent over the past decade. Yet the knowledge I thought I had built up through travelling- while offering a good foundation- was far from extensive and exhaustive. Upon starting my master’s in September 2016, my fellow classmates and I were immersed in a world of debate, discourse and theories on Africa’s history, present and future. These were very interdisciplinary in nature, covering economic, anthropological, political and environmental angles, to name but a few. While not everything I have learned has been useful for my time here, it has provided relevant framing and context. As my research focuses on entrepreneurship and business practices, everything I learned during the course regarding economic developments and trends, both within Ghana as across the continent as a whole, has been invaluable in framing my research and internship responsibilities. Furthermore, understanding Ghana’s and West Africa’s cultural, historical and political legacies has allowed me to fully explore and appreciate my environment. The rate of development across many African countries over the past few decades has seen much talk of the ‘Africa Rising’ narrative, as well as attention and interest bestowed upon a multitude of advancements. This has been coupled and realised by huge amounts of mobile and smartphone penetration across the continent, debated technological ‘leapfrogging’ (mobile money, tech hubs etc.) and a focus on trade or enterprise led initiatives as opposed to ‘aid-led’ solutions. The speed, energy and extent of these changes is something which can not be captured in academic texts or lectures. It’s something you can’t read about, but something you have to witness and can only ‘learn’ about by being here. That is why the internship and research component of this master’s programme is so valuable and important. It teaches you what sitting in a classroom can never teach you: the daily observations, practical learnings and context of your research and internship. It is only by speaking with as many people as possible, fully immersing yourself in this environment and framing this within what you have learned during lectures, that you can fully make the most of this unique opportunity. Getting involved in as many activities and chances as possible, speaking to multiple key stakeholders and seizing any chance to be confronted with a new way of thinking or a novel theory is ultimately what has inspired me the most. 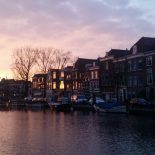 This entry was posted on March 31, 2017 by admin@theleidener in Guest Blogger and tagged africa, african studies, career, culture, Experience, International, international student, internship, leiden, Leidener, master's, netherlands, study abroad, the netherlands, travel.